Popular culture in this "biological century" seems to feed on proliferating fears, anxieties, and hopes around the life sciences at a time when such basic concepts as scientific truth, race and gender identity, and the human itself are destabilized in the public eye. Tactical Biopolitics suggests that the political challenges at the intersection of life, science, and art are best addressed through a combination of artistic intervention, critical theorizing, and reflective practices. Transcending disciplinary boundaries, contributions to this volume focus on the political significance of recent advances in the biological sciences and explore the possibility of public participation in scientific discourse, drawing on research and practice in art, biology, critical theory, anthropology, and cultural studies. After framing the subject in terms of both biology and art, Tactical Biopolitics discusses such topics as race and genetics (with contributions from leading biologists Richard Lewontin and Richard Levins); feminist bioscience; the politics of scientific expertise; bioart and the public sphere (with an essay by artist Claire Pentecost); activism and public health (with an essay by Treatment Action Group co-founder Mark Harrington); biosecurity after 9/11 (with essays by artists' collective Critical Art Ensemble and anthropologist Paul Rabinow); and human-animal interaction (with a framing essay by cultural theorist Donna Haraway). 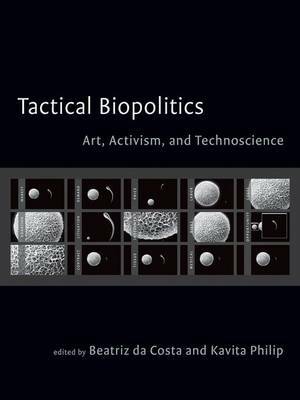 Buy Tactical Biopolitics by Beatriz Da Costa from Australia's Online Independent Bookstore, Boomerang Books.